june 5, 2000. Last week artist Ron Henggeler sent a message to a number of publications, proposing that the city light up its skyline at night. The idea so intrigued the folks at the Chronicle that they ran it twice, once as a letter to the editor and once as an item in Dave Ford’s column, along with the sputter, "But, I mean, really, super-bright lights burning well into the night?" If you're in my neighborhood sometime, check out the tower in my front yard. 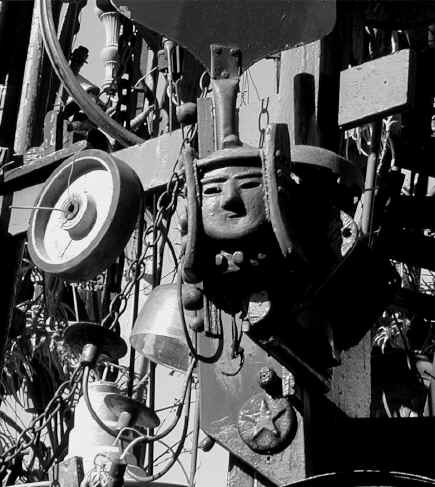 It is a wind-powered chimes-and-bells prayer tower built with found objects. Mozart's Magic Flute, Saint Francis of Assisi, and San Francisco as the Phoenix Rising is the theme and motif of the structure. It is on Fulton Street between Fillmore and Steiner around the corner from Alamo Square. From Thanksgiving until New Year’s Day each year, I light up on the tower a 6-foot-diameter peace symbol that has 2,700 tiny lights on it. How could anyone resist such an invitation? I managed to be "in the neighborhood" the very next day and discovered that the tower is just the entry point to an astonishing vision. The tower itself, anchored in a circle of cement, rises three stories above the sidewalk. Mirrors catch the sunlight — Henggeler says they glow red and green at night from the stop light at the corner of Steiner. 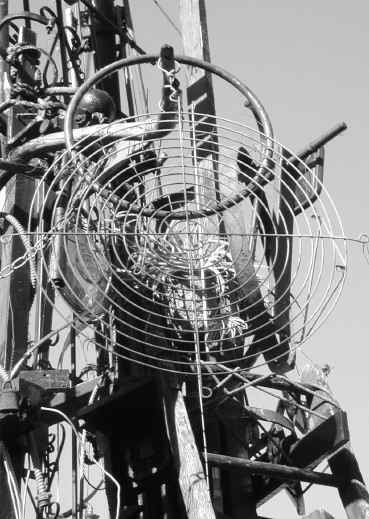 Metal objects catch the wind, emitting a variety of tones depending on its direction and velocity. A metal patio table suspended deep within the center of the structure remains silent much of the time, saving its deep foghorn-like moans for winter’s fiercest storms. Nasturtiums ring the poles at the base and spider plants hang from the rafters. The entire structure is gradually returning to the earth — a tiny wooden train breaks off as we watch. Last rainy season mushrooms sprouted from the thick black logs. Henggeler lives in one of the late-nineteenth-century turreted and curlicued mansions that make up the Alamo Square historical district. A slender man with strong craftsman’s hands, he shares the space with four other humans and about a dozen hairless cats. Yes, hairless. Imagine Yoda’s face on a velveteen whippet’s body. Intelligent and talkative, the creatures wander in and out of the ornate nooks like gargoyles brought to life. They prowl through indoor gardens of potted plants, chewing on an occasional leaf, and make their way past thousands of books, many devoted to San Francisco history or Native American lore. The rooms in the upper floors are lined with more found objects, glued to the woodwork or acquiring a life all their own inside one-gallon glass jars. Twenty years ago, Henggeler was absorbed in constructing elaborate collages. Every Christmas card and poster he shows me is composed of dozens of tiny old drawings overlying a circular framework. "It’s the diversity," he says, blue eyes shining, "the countless different forms, which make the earth — and particularly San Francisco — so exciting." The entire San Francisco skyline should be outlined with white lights just as the Embarcadero Center is at Christmas time. The sight of it would be incredible, a futuristic vision of Herb Caen's Baghdad by the Bay. We should have started this project ten years ago in time for the millennium celebrations. But we could begin now in time to commemorate the centennial of the 1906 fire and earthquake in 2006. Let there be light, he says. Many lights.